"Canadians send 45 million text messages a day," said Hall. "That has created a tremendous strain on our network and we can no longer afford to provide the service for free." These increases have even prompted Twitter to neuter their text message updates in Canada. Of course, there have been people saying for a few years (with math to back it up!) that the small size of text messages cannot cause enough strain to justify phone carrier prices. Well, I've just read an article from a few days ago in The New York Times, saying that not only are text messages small, but that they're wrapped in a packet that the phone sends anyway! "But text messages are not just tiny; they are also free riders, tucked into what’s called a control channel, space reserved for operation of the wireless network. That’s why a message is so limited in length: it must not exceed the length of the message used for internal communication between tower and handset to set up a call. The channel uses space whether or not a text message is inserted." So, what's this BS of rising costs being because of increased usage? Prices gouging is wonderful, isn't it? And people I know argue with me when I say cell phones are a ripoff. Ha! I came across this article today. Apparently otters are making a return to the English urban scene. Urban Otters!!! 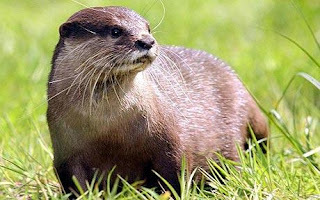 I love otters. They are one of my favourite animals. I love watching them at the zoo. In fact, I once ran into one on a leash there in the visitor's centre. Cute. The article also included this awesome otter picture! Urban Otters!!! I'm done now. For those of you who are as excited and nervous as I am over the upcoming Trek film, here's a video sent to me by my brother with the trailer's audio on top of clips from the old animated series. I haven't posted in a while. I guess I just took a blog break after the Korean Adventure posts. I start getting back into it. First though, I want to mention that a few days ago Toronto officially broke our record for wettest year. We've hit 975 mm of rain and snow, breaking our previous 1977 record. Ha, and the year's not even over yet. I have to say, it really did rain a lot this summer, and as I've mentioned, it was a very snowy winter. I like that after all that we got a record though.